and labarum with chi-rho on banner, in a galley piloted by Victory on right. 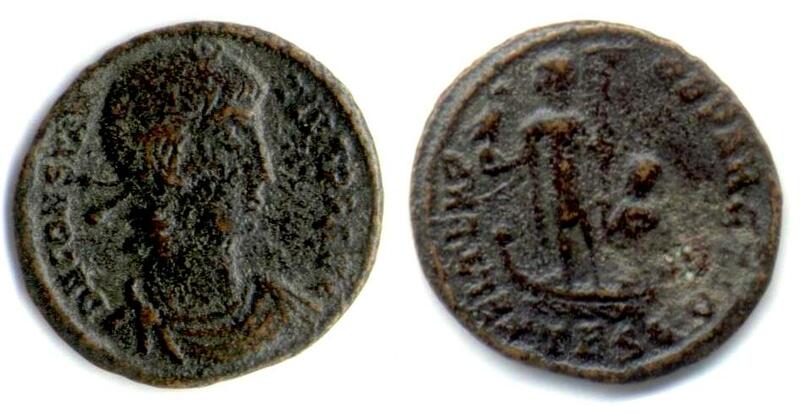 Minted at officina delta in Thessalonica (Saloniki, Greece) between 348 and 350 A.D.
Kent, J.P.C., "Roman Imperial Coinage", Volume 8 (RIC), Thessalonica, p412, nr. 119.
hinterlassenen Sammlung und Aufzeichnung des Herrn Paul Gerin" (Voetter-Gerin), Thessalonica, Constantius II, p344, nr 15. Van Meter, D, "Handbook of Roman Imperial Coins", p300, nr 96.